Mapo Tofu will always have a special place in my heart as the first way I discovered of making tofu taste delicious. Sometimes, however, Mapo Tofu’s explosion of Sichuan pepper and chilli heat is just too much, hence the much lighter delicious tofu dish #2: Tofu Larb. 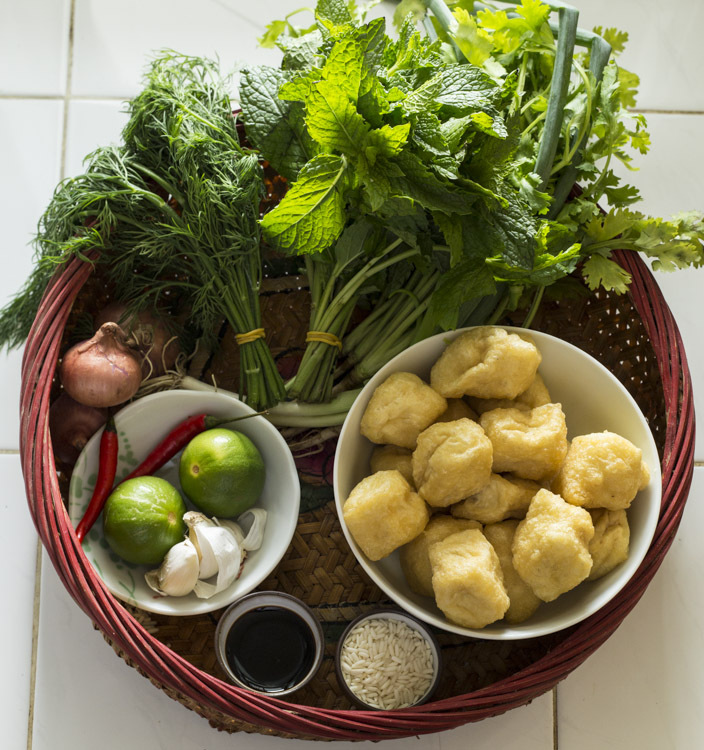 When I was working as a tour guide, I drove through northern Laos regularly enough to develop a serious addiction to sticky rice and larb – the Lao national dish of minced protein (usually pork, chicken or tofu) tossed with piles of herbs, shallots and lime juice. 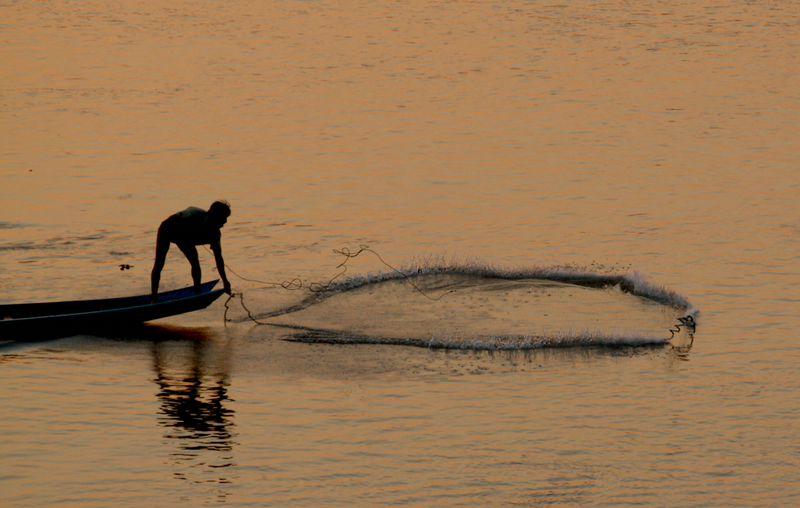 I would take my guests to the restaurant at the lovely Boat Landing Guesthouse outside Luang Namtha and over-order in the secret hope of a doggy bag. 1. Heat a dry frying pan and roast the rice until it is just starting to colour. 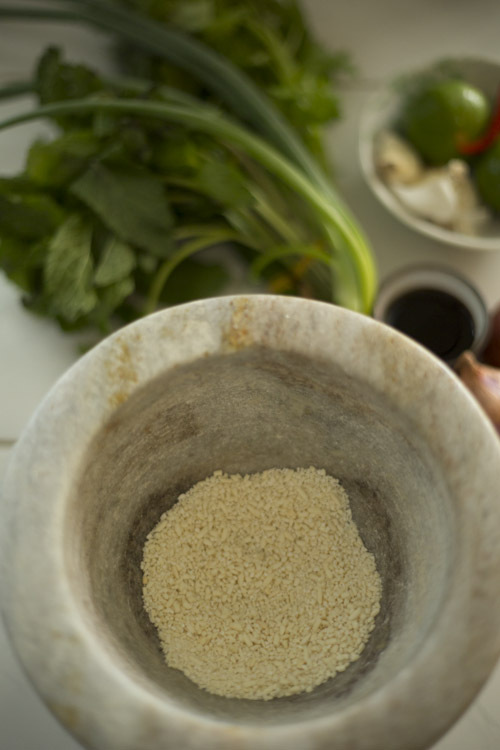 Grind the roasted rice and set to one side. 2. Prepare the tofu. If it’s already been deep-fried, just mince it roughly and you’re good to go. If your tofu is still at the white-and-wobbly stage, cut it into cubes, heat some oil in a pan and fry until the outside is golden brown. I leave the depth of the oil at your discretion – the main aim is to cook it through and firm up the outside, so both deep-frying and shallow-frying are fine here. Wait for it to cool enough to handle, then mince roughly. Mince the garlic and fry in a little oil until it turns golden. 3. With the tofu in a mixing bowl, add the soy sauce, lime juice water/stock, garlic and ground roasted rice. Add the garlic to the bowl, incorporate everything evenly to ensure the flavourings reach all of the tofu. Roughly chop the herbs and spring onion, slice the shallots and chilli, then mix everything into the tofu – by hand seems to work best. 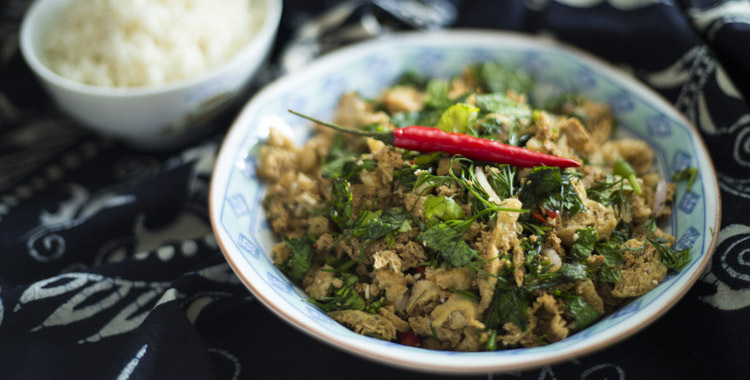 Check seasoning and serve – see below for ideas on how to eat your larb. 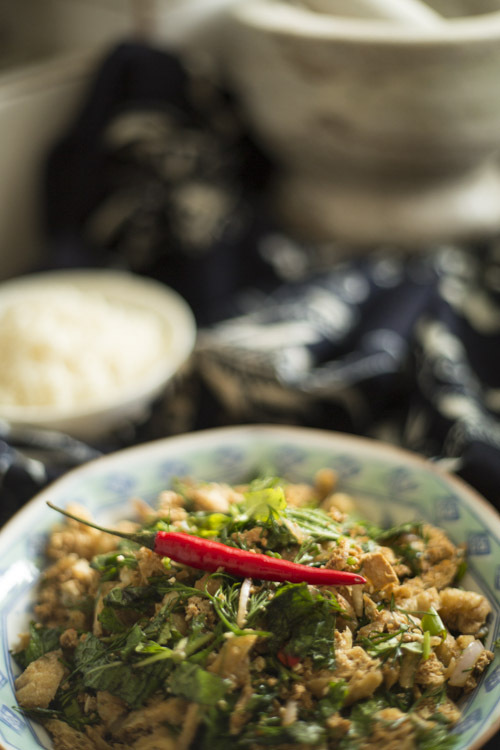 Serve spoonfuls of larb in lettuce leaf cups (Little Gem works well) or on slices of cucumber. 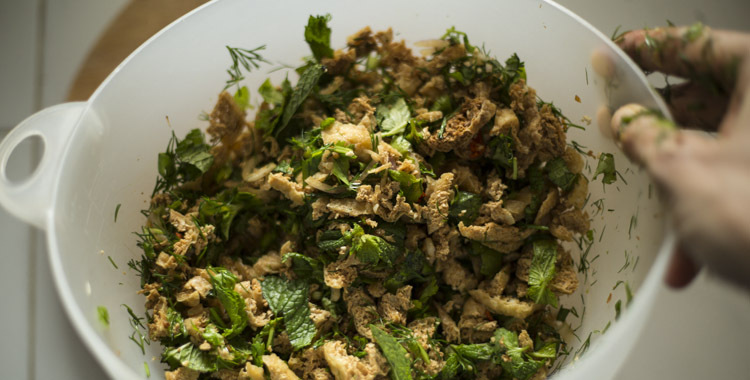 Your larb is best served soon after making, otherwise all those lovely herbs will shrivel away to nothing. Diminished looks aside, the leftovers will keep nicely for 1-2 days in the fridge. Very similar to Thai’s laab dish. 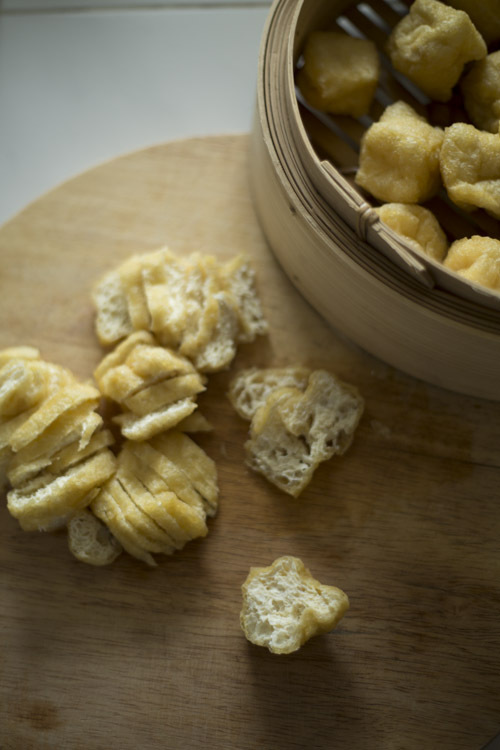 I like the way you use the puffy tofu. What is a wet market? © 2015 Joanna James | All Rights Reserved.